Whose bright idea was it to make it fun to give back? Cause Layouts, of course! With the undying popularity of social media in general, and Facebook specifically, why not use that high traffic to bring attention to charitable causes? Getting a layout and supporting your favorite cause(s) are quite simple. All you have to do is find the cause you are interested in supporting, download the layout and voilà, you have just donated $1 to the cause! 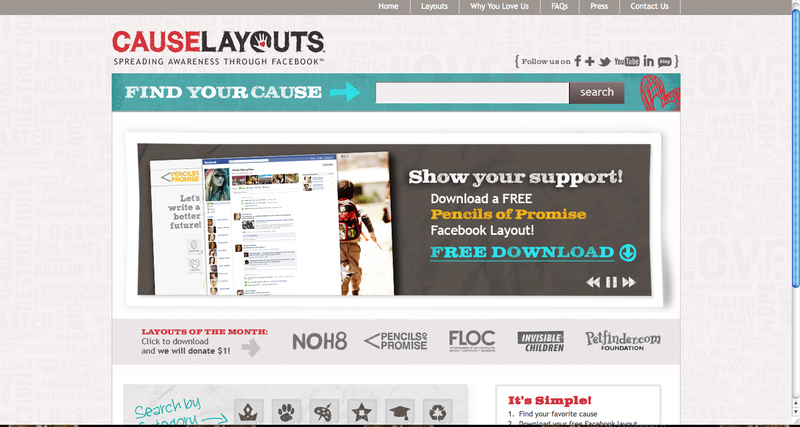 Cause Layouts will donate $1 for every download of a layout. While there is a wide variety of charities and causes to choose a layout from, there are also monthly causes that are featured on their front page. This month’s causes include NOH8, Pencils of Promise, Future Leaders of Our Community (FLOC), Invisible Children and Pet Finder. You also can suggest a cause, if you cannot find it on the site.